Ski touring is an activity that consists of skiing the mountain uphill and downhill independently and responsibly. On the ascent, the heel is released, sealskins are used which are glued under the skis and eventually knives when the snow is frozen. Downhill, the classic characteristics of downhill skiing can be found. There are several terms for this discipline, depending on the way of practising: mountain skiing, ski touring (recreation approach) and ski mountaineering (competition approach). Today, ski touring attracts an increasing number of people and a growing variety of people. Formerly reserved for experienced hikers with a strong mountain culture, it is nowadays of interest to more urban audiences, looking for an endurance ski and the discovery of large natural areas. Today there are nearly 85,000 practitioners in France, 700,000 in Austria and 200,000 in Switzerland. However, this practice can be dangerous without the usual precautions: adapted equipment (ski and dva) and knowledge (safety, weather, technique, etc.). Faced with a difficult mountain environment, many hikers go up the downhill ski slopes, which is something that the resorts regret, which rightly fear accidents. What is a Ski Touring Resort ? Ski Touring Resort® is a pedagogical space, totally integrated in the ski area, dedicated to the initiation and fitness practice of cross-country skiing. It offers a completely secure route beside the slopes and a range of tools to offer you a complete and quality experience in your ski touring practice. Beginner hikers will be able to go up the safe routes and down the slopes, they will also be able to alternate ski touring and downhill skiing during their stay and each member of the family will be able to practice their activity. More experienced hikers will appreciate our training tools such as ARVA-PARK and fallback routes on days when the risks are too high. A programme of educational and playful activities, throughout the season to accompany you in your learning: ABC Ski touring, Field trips with guide, DVA 1&2 training, etc. 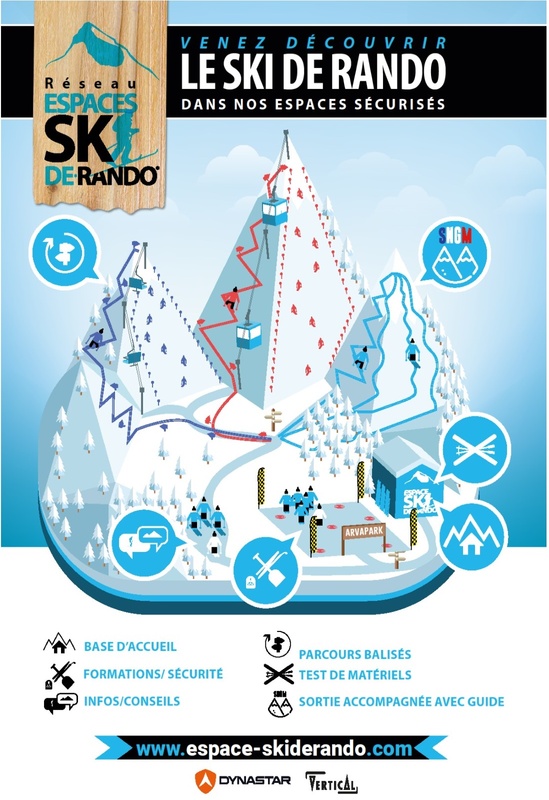 The Ski Touring Resort Network. Ambition n°1: learn to ski touring and share our passion for this activity. We are passionate skiers of hiking and we have gathered around this project reference brands, VERTICAL, DYNASTAR, ARVA, PLUM, SCARPA, dynamic local organizations, passionate mountain guides, ANENA (training), to make you discover both ski touring and the massifs welcoming our concept. Providing several services to experienced ski tourers, using training tools such as ARVA-parkland or fallback routes on days when risks are too high. We want to be a place where ski touring is shared between all the actors, and we put in touch with the practitioners and the local interlocutors such as the ski lifts, ANENA, the NFB, the Natural Parks, etc? The goal of cross-country skiing is clearly not to ski downhill on the slopes, we fully agree. But like a driving school to learn how to drive, a climbing wall before going on the big mountain routes, we think that our Ski Touring Resort will allow you to start and learn about safety before discovering the real ski touring: in the mountains. We wish you a good learning experience, enjoyable outings and stay safe. The team of the Ski Touring Network.